We've started getting the initial Trimble Soil Information System results back. Here's an example of the kind of in-depth information participants are receiving. We're discovering a lot of information about the fields, especially the subsoil physical and chemical properties. This will help us implement better precision farming practices with more accurate prescriptions for nutrient application. We're also able to better map out compaction zones, root restriction areas, and infiltration rates. Interested in participating in the project? Here are some answers to questions you might have. Not familiar with Iowa State's STRIPS program? Have a look at this exciting effort! STRIPS stands for Science-based Trials of Rowcrops Integrated with Prairie Strips. The project is composed of a team of scientists, educators, and extension specialists who have chosen to work together on the use of prairie strips as an farmland conservation practice. We strive to more fully understand the assembly, management, function, and value of prairie strips; to communicate our results to diverse audiences; and to assist others with the implementation of prairie strips within farm fields. Our initial research site is located at Neal Smith National Wildlife Refuge near Prairie City, Iowa. We are now implementing and maintaining research and demonstration sites across the Midwest, including on private commercial farms. Click on the image below to watch the Vimeo video about STRIPS. Preserving the Balance: Prairie Conservation Strips from ISUCALS on Vimeo. Published on Apr 14, 2015 Missouri’s tall grass prairie once covered 15 million acres; today, less than one percent remains—and these fragments of a mighty ecosystem continue to provide benefits we cannot afford to lose. In her TED Talk, Carol Davit may focus on Missouri, but most of what she talks about reflects on Iowa and the rest of the prairie states, as well. Thinking about alternative uses for your marginal lands? 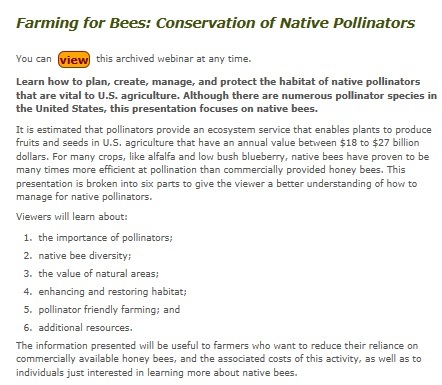 Here's a guide for installing conservation cover for pollinators.